The following Situation Update was received by KHRG in June 2017. It was written by a community member in Mergui-Tavoy District who has been trained by KHRG to monitor human rights conditions. It is presented below translated exactly as originally written, save for minor edits for clarity and security. This report was received along with other information from Mergui-Tavoy District, including one interview and 45 photographs. The majority of the people from villages in Ta Naw Th’Ree Township are Karen people. Nevertheless, there are a few villages where Burmese people and Karen people live together. There are not only Karen villages, Burmese villages and Muslim villages in [Ta Naw Th’Ree] Township but also villages containing Salon people, who live on islands and alongside the sea. There are many religions present such as Baptist, Roman Catholic, Buddhism, Muslim and Hindu [in Ta Naw Th’Ree Township]. Most of the people in Ta Naw Th’Ree Township earn a living by farming [both on the plains and hills]. Some villagers transport their animals to Thailand in order to sell them. There are some villagers who work in the morning and eat in the evening [live and work hand to mouth]. There are some people who earn a living by hunting and logging in the jungle, especially Burmese and Muslim villagers. The Karen people who live on the bay find their food in the sea, specifically, they go fishing on a boat. Regarding the situation of education in the rural area of Ta Naw Th’Ree Township, there is one middle school in Ta Kel area, one school in Plaw Thaw village, one primary school in Paw Mu Ghar village, one middle school in Kit village, one middle school in Meh Wah village and one middle school in Thoo Lay Plaw village. These schools are situated in the Karen National Union (KNU) controlled area. Karen language is taught in these schools but it is not taught for the whole day. It is only taught for one period [one hour] per day. There are Burmese teachers and also Karen teachers. The person who is in charge of the [local] Karen Education and Culture Department is P’doh Saw Sel Khae who runs Thoo Lay Plaw school. If local students finish their schooling [in rural areas], they have to continue their study in towns. Some students can continue their studies in towns but some students cannot continue their studies because their parents are poor. There are clinics in some Karen villages but there is not enough medicine nor are there enough healthcare workers. If villagers are seriously sick, they have to go to a hospital in town [in order to get medical treatment]. However, the problem is that villagers do not have enough money to pay for the medical fees. Mostly, there are diseases such as anaemia and malaria. Most of the people who suffer from these diseases are mothers who have young babies and elderly people. [The Burma/Myanmar government] provides access to vaccinations in villages one time per month, however, only children can get vaccinated. There is no [free] healthcare service for old people. Due to health issues, some villagers have to pay a healthcare service fee and medical fee [which they cannot afford] so they have to take out a loan. Therefore, they are in debt. Then, they have to pay back the loan. 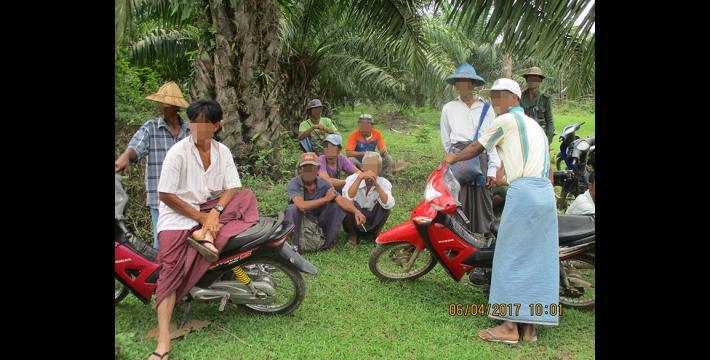 A--- villagers in Ta Kel area reported that the CKB Company came to the village together with Tatmadaw soldiers and Pyithu sit and they have confiscated 325 acres of villagers’ land since 2002. Regarding [these cases of] land confiscation, villagers and the village head report that they have not consulted and that [the CKB Company] forced villagers to leave their houses. They [CKB Company] cut all of the villagers’ trees [after they confiscated the land] and they planted a palm oil plantation instead. They are still planting palm oil trees. 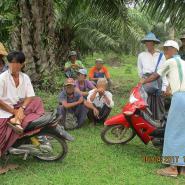 Villagers reported it [land confiscation case] to the forestry department of the Burma/Myanmar government but they have not received any reply. On April 4th 2017 staff from the Land Measurement Department [Myanmar government] came to measure the confiscated land. In 2014 the KNU had also measured the confiscated land. The owner of the CKB Company is U Bo Sein and he lives in Yangon. However, he did not come to confiscate the land in person but he asked his manager, U Kalar Gyi or U San Win, and the leader of Pyithu sit, U Htay Oo [to confiscate the villagers’ lands]. Villagers really want their ancestral land back to use for their livelihood and the new generation. Villagers will be satisfied if they get at least 50,000 kyat [US$36.64] per acre as compensation. However, villagers really want their legacy [ancestral land]. A community development [group/company] came to conduct road construction in B--- village. The road construction destroyed Saw C---‘s garden including rubber trees, cashew nut trees, betel nut trees and other trees. The community development [group/company] did not consult with local villagers when they came to conduct the road construction. They said that they got permission from the Burma/Myanmar government to conduct road construction [although] this place is reserved forest. The issue that villagers now face is that their lands have been covered in gravel [due to the road construction]. During the road construction, stones were thrown into the villagers’ rubber plantations which damaged the plantations. Therefore, villagers cannot tap rubber trees to make the rubber [as the rubber trees have been damaged]. In addition, mud from the road flows into the river near the village during the rainy season. Thus, villagers cannot drink the water from the river anymore and they are only able to use rain water [for drinking]. There are about [censored] houses in B--- village, Ta Naw Th’Ree Township, Mergui-Tavoy District. The village head of B--- village is Saw D---. The communication system has improved in rural areas and now villagers can contact each other via phones. The travel system has also improved because villagers can use motorbikes and cars in order to travel [in rural areas]. However, the [condition of the] roads are not good in every village. The roads in towns are constructed to a better [quality] than before. Ta Naw Th’Ree Township is located in the southern part of Mergui-Tavoy District. The [Ta Naw Th’Ree] Township’s office [KNU] is built in E--- village and established in 2012 after the preliminary ceasefire was signed. The Township leader is P’doh Saw Nya Wah. The secretary of the Township is P’doh Saw Htee Wah. The vice secretary of the Township is P’doh Saw Baw Nay who also works for the forestry department. This report is about the overall situation in Ta Naw Th’Ree Township and the information was collected in 2017.